The Waroona Oval is home to a lot of different things including sport, shows, celebrations, events that are held on the oval. There are also schools that use the oval. The Memorial Hall was constructed in 1932 and has several uses including social events, discos, dances, amphitheatre and picture shows. The Waroona Historical Society and museum offers a wide variety of photos, maps and interesting memorabilia for the general public to see. The Waroona Historical Society was formed in 1982. Their first meeting was 18th of May 1982. Many sports both past and present are held at the oval. These include Football, Cricket, Basketball, Netball, Bowls and Tennis. Lots of people play football. I know this because I play the sport and there are many different competitions. Most of the teams compete against different country towns. The club rooms for the Waroona Football club are located at the southern end of the ground and were opened in 1993. Cricket used to be played on the oval but now has been moved to the new oval above the recreation centre. The cricket club was formed in 1931. The new pavilion was opened in 1995 is located behind the Recreation Centre. In 1955 the basketball competition began. Basketball was played on the outside courts near Memorial Hall. This was originally a men’s only competition but became women's sport as well as theirre were more and more women who wanted to play the sport too. In the 70s, 80s and 90s the sport was thriving. The basketball competition is now located at the Recreation Centre. The Waroona Bowling Club was opened in 1958 and now has many members and holds many social events. It previously had 1 green and now has 2 greens, one of which is synthetic. Tennis was originally played on a gravel court. Then 2 two new courts where built on the north side of the Memorial Hall in the 1936. In the 1950’s, six new courts and a club house were built on the present day site. Netball was started in 1953 and was played on the old basketball courts. They played in the courts for several years until 1989 when they moved to the Recreation Centre and to this day it is still played there. 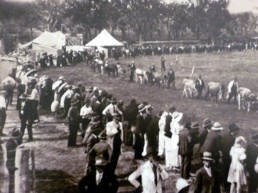 The Waroona Agricultural Show has been held at the oval since the 1925 except during WW2. The show goes from 8:00am until 9pm so it should be a good day out with family and friends. The main reason for the show was for people to meet up with friends and family at a social event. They also wanted to show off their animals and produce. The main thing is that you have fun! The cattle shed is used for exhibiting cattle on Show day. The poultry shed is used for the exhibiting poultry on show day and special events. The Cyril’s Landing Animal Nursery is open on show day and it encourages young children to pat and hold the animals. The Lions Club have “Jim’s Kitchen” which was once the old bar used on the Waroona show day. It is now used for catering for special events. The Waroona Lions Club is a volunteer organisation that helps the Waroona community and the surrounding area. The Walmsley Memorial Pavilion was jointly built by the Agricultural Society and the Waroona Lions Club. It is used by the community and was built in 2008. Alongside the Pavilion is a toilet block and a sullage dump point for caravans. Since the 1920s the oval has been in used in many different ways. 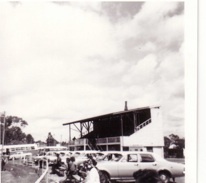 There used to be a grandstand where the car parks are now, north of the Memorial Hall, but it got damaged during Cyclone Alby in 1978. The fire and rescue service members are all volunteers fighting fires in Waroona area. The shed is used to display big machinery and also used for social events and a Farriers competition on show day. The Waroona Senior Citizens Social Centre opened 7th June 1969. It is used by the elderly as a meeting place.